When the clock strikes midnight, does the world change? No, not really. Truthfully, it’s like any other night at midnight…..it’s late. But, on New Year’s Eve, we wait all night to shout out “Happy New Year” and then it’s all over. So, why not celebrate it over and over again, hour after hour? After all, over a 24 hour period, there is someone celebrating almost every hour somewhere in the world. This is the way to do it! For the last four years, Big Bar in Los Feliz has taken us on a journey around the world as we celebrate New Year’s Eve in another city starting at 3pm until midnight. 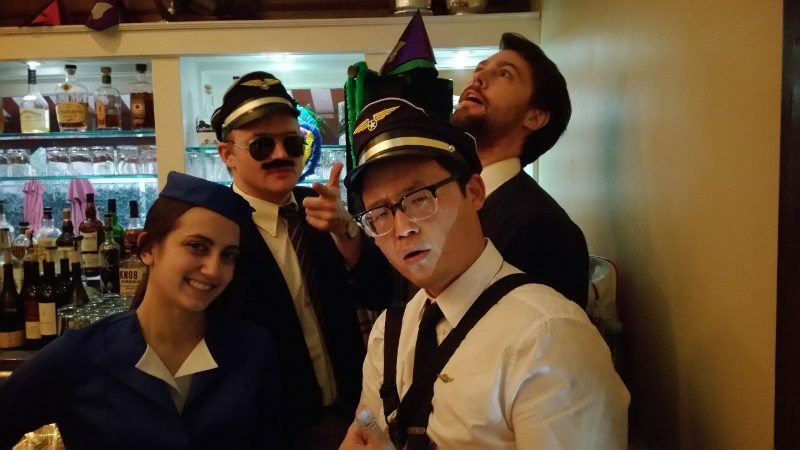 The bar crew at Big Bar become our flight crew as we start in Paris and end in Los Angeles. The 2nd year was much like the first except they started at 3pm. The 3rd year they introduced the cocktail passport, complete with passport stamp, drawn by Dave Stolte. Year 4, the one we just had, Dave Stolte drew 10 unique postcards, one for each drink. 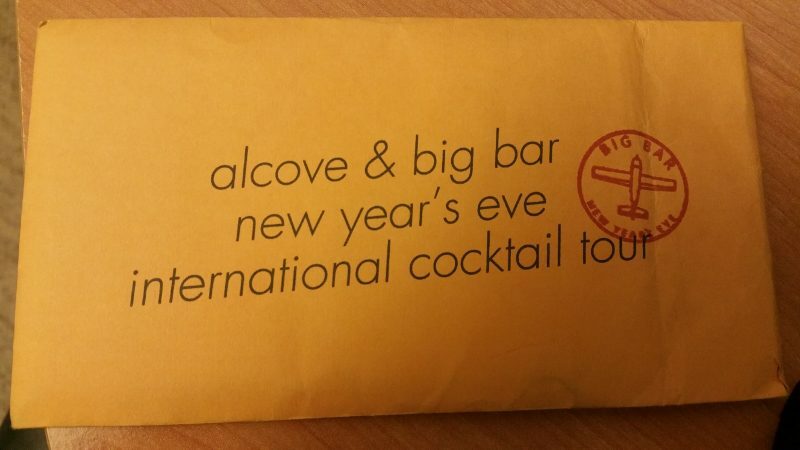 As guests arrived to the bar, they received a package with a series of cards inside. Each hour a specialty drink is offered that has been created to represent the country or countries that are celebrating New Years Eve. 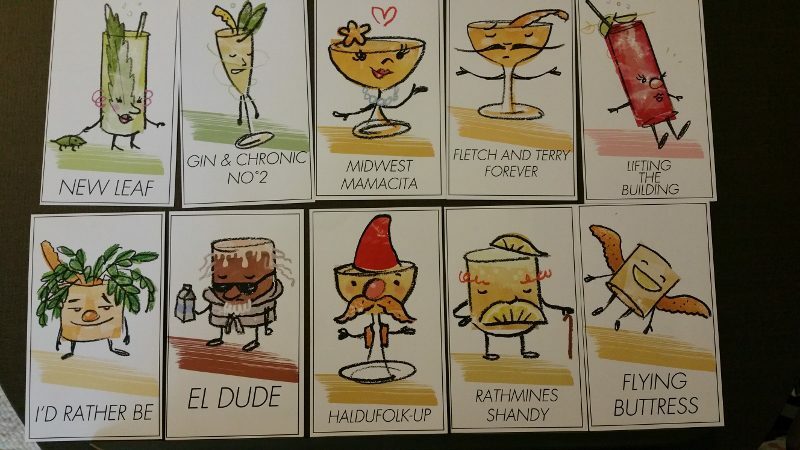 Each card has a picture of the cocktail that was drawn by Dave Stolte. 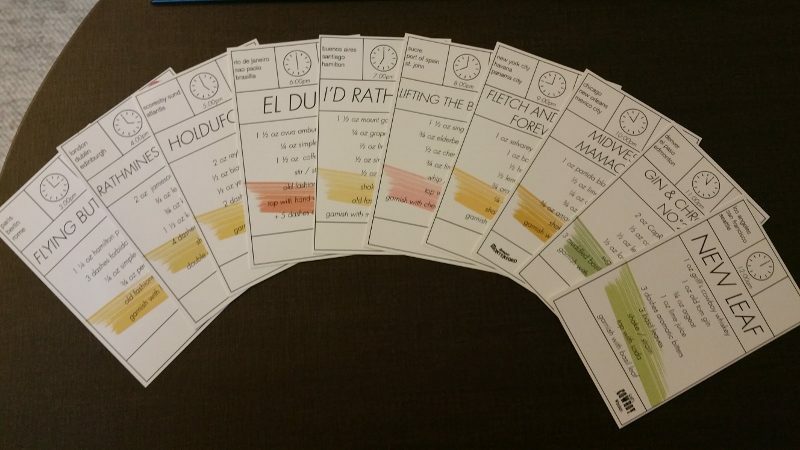 On the back of each card is the drink recipe, as well as the hour/city it is representing. 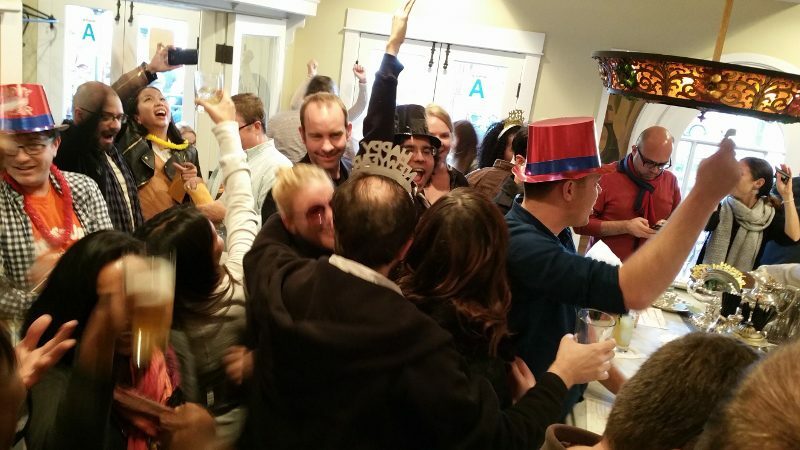 As the countdown begins, the crowd gets quiet and erupts with a “…3,2,1, Happy New year!” cheer and then gets back to drinking and conversation. The same thing happens at 4pm, 5pm and so on until it’s 12am in Los Angeles. What’s great is that anyone and everyone can get in the spirit of the new year without having to stay out til midnight. And, celebrating it more than one time during an evening makes it actually a bit more fun and less anti-climatic. I started at 3pm and made it until 9pm and then was happily tucked in bed by midnight. I hope 2015 is off to a great start for everyone…..have a great year! This entry was posted in Cocktails, Lifestyle and tagged Alcove & Big Bar, avua ambruana cachaca, Big Bar, Cocktails, Dave Stolte, DrinkWire, Eugene Lee, hamilton pot still rum, Happy New Year, international cocktail tour, jameson black barrel, Liquor.com, Los Feliz, mount gay black barrel, New Years Eve, reyka vodka, selvarey cacao rum, singani 63 by Allison Levine.